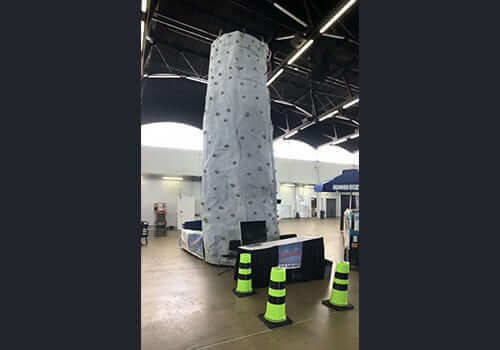 Our portable climbing wall requires a level set up area 24 feet long by 12 feet wide with a clearance height of 29 feet. A GREAT 4 STATION ROCK CLIMBING WALL WITH AUTO BELAY ON EACH STATION. 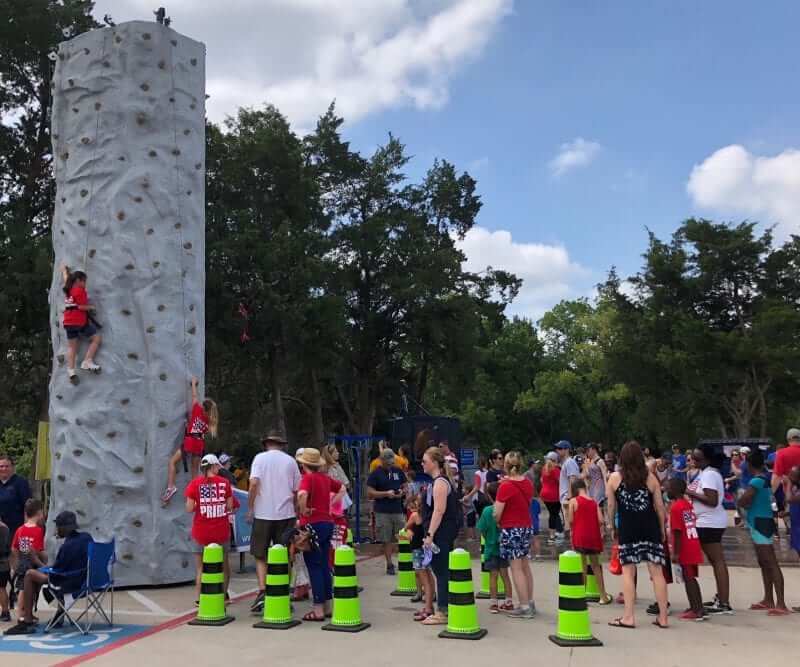 Offering mobile rock climbing wall rentals, Starwalk of Dallas will make your next event a memorable one. From corporate events to private birthday parties, our mobile rock wall rentals are always a hit! Towering 25 feet above the ground, our portable climbing wall make a great interactive centerpiece for any occasion. 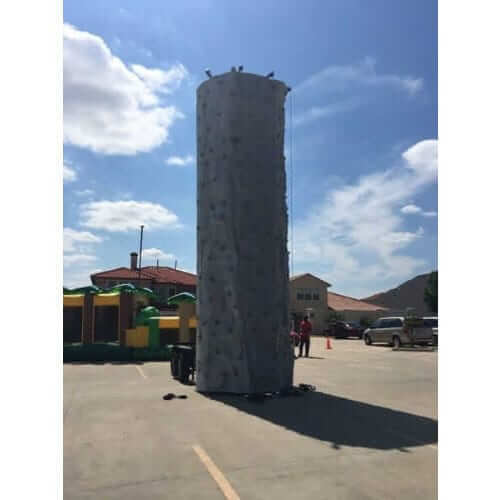 In addition, the mobile rock climbing wall can be coupled with our zip-line rental and obstacle course rentals and bounce house rentals. For large events, consider the portable rock wall and bungee trampoline combo with an obstacle course. Fun times for all. Our staff help guide participants on how to scale the wall while fastening them into protective climbing harnesses. Each participant is given instructions on climbing the rock wall. Also, we explain the procedure to get off down. We enjoy watching people of all age scale to the top of the rock wall. We offer 4 people (4 route) climbing the wall with an auto-belay to allow ease of getting down and for safety. Starwalk of Dallas uses only the best industry leading equipment. All equipment, staff, set-up & insurance are provided for your event. Our portable rock climbing wall requires a level set up area 24 feet long by 12 feet wide with a clearance height of 29 feet. We tow the rock climbing wall into place with a standard pick-up truck. So, ensure that there is available space to adequately pull a vehicle and trailer into place. Set-up takes less than 15 minutes. We typically provides 2 event staff in our pricing. For larger events or events requiring more throughput, 3 staff can be provided at an additional fee. 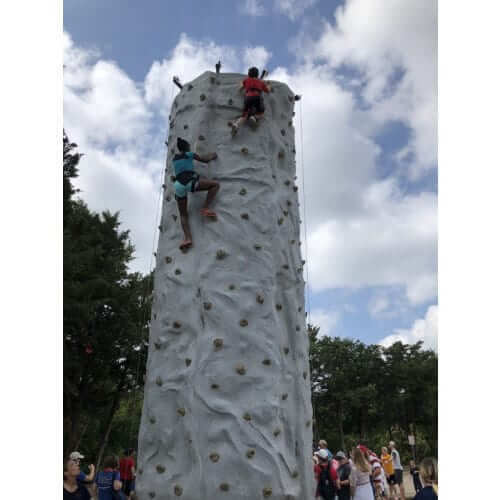 The climbing walls are suitable for all ages and abilities with children ages 6 and up, teens and adults getting the most enjoyment from our interactive climbing station. We deliver the rock wall throughout the Dallas and Fort Worth Metroplex. We also make special trips that our outside our territory for larger events. Because the rock wall requires a dedicated vehicle, extra delivery fees may apply. Check out our delivery zones and zip codes in our standard delivery territory. 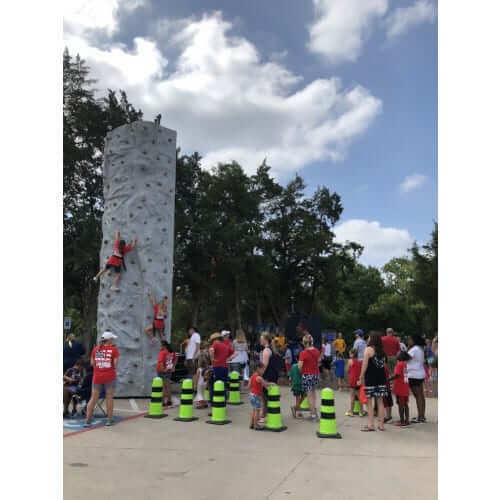 Located in Richardson or Carrollton Texas – Try our Rock Climbing Wall and Kona Ice combo.